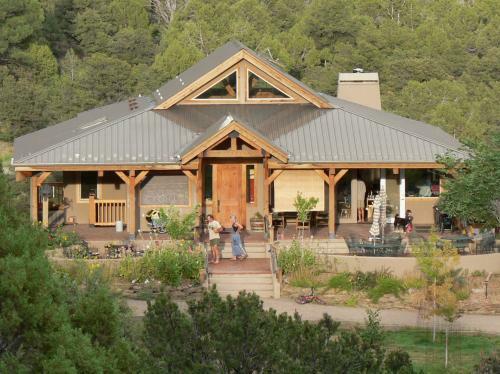 Heartwood Cohousing, 361 acres in southwest Colorado (Durango/Bayfield area). Completed in 2000 and looking forward to beginning Phase 2 soon! Located twenty minutes east of Durango (and 3 miles NW of Bayfield), Heartwood Cohousing has 24 private homes on private lots, a large and beautiful Common House with open air terrace, a village green and playground, a separate workshop and greenhouse, all clustered snugly on 7 acres, surrounded by 350 acres of community-owned woodlands, trails and open space, including 50 acres of irrigated pastures and community gardens. Residing at 7100 ft elevation, where the high red-rock deserts of the Four Corners region merge into the majestic, 13-14,000 ft San Juan Mountains – we thrive in one of Colorado's most stunning regions. At Heartwood, you know your neighbors and are known by your neighbors. You can plant a garden, raise a family, run a business, form deep friendships, and find your home in community. We've packed a lot of information into our newly redesigned website. Please take a look around and virtually explore Heartwood Cohousing. If you like what you see, click on the "GET IN TOUCH" link to stay connected via our "Heartwood Happenings" newsletter. Whether your goals are the deep connection of community, dirt-under-the-fingernails home-grown simplicity, an active outdoor lifestyle that includes world-class hiking, road and mountain biking, skiing, kayaking and rafting, weekend family trips to the desert or the high mountain wilderness, or an evening of excellent food and entertainment in nearby Durango, Heartwood is the place to live, love, put down roots, raise your family, grow together, prosper and change the world, one neighborhood at a time.